Program adopted by world class grandmaster and 2006 US Open Chess Champion and 2008 US Champion Yury Shulman in 2006. 200 students and 5 teachers awarded The Presidents Volunteer Service Award from The White House from 2005 -2018. Simultaneous Chess match held at Community Unit School District 220 by the Woman’s World Champion Grandmaster Susan Polgar in 2010. 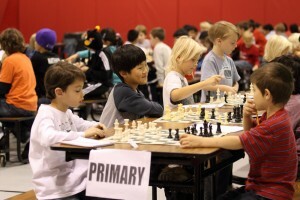 Chess Tournament hosted by chess volunteer and former Bulls Basketball player B. J. Armstrong at Barrington High School in 2008. Founder of the chess program Rishi Sethi won the Prudential Award, Presidential Freedom Scholarship Award, the AXA and US News and World Report Scholarship Award in 2006-2007 and was the Finalist for the 2008 Harris Wofford Award. Sujit Johnston won the Kohl’s Award 2012 and many other students have won various awards for their service with the organization. Finalist for the 2009 Chicago Innovation Award for innovation and entrepreneurship. Citation from The Jane Goodall Institute in 2009 to 2017 for implementation of humanitarian projects. Winner of The Unsung Hero Award for Project Meher presented by Radiostation Y103.9 and Advocate Hospital in 2010. Produced a documentary “A Future for Meher” chronicling the humanitarian work done by the program. This was entered in the 2011 Emmy Awards and in the 2012 Elgin Film Festival. The program is regularly honored for its excellence combining learning, service and philanthropy in local, national and international newspapers, journals and web sites. Several students continue to volunteer, win awards and scholarships for their work with the program. Program has donated over $160,000 to various charities through chess events. Started chess programs through donation of chess sets and textbooks internationally in Nigeria, Sudan, The Marshall Islands, India, Cambodia, Malaysia, Thailand, Chile and nationally in needy schools in the US. Youth from the program are invited to attend the UN Youth Assembly in New York for their humanitarian work since 2009. Junior Madison Rossi represented Chess Without Borders at the UN Youth Assembly in August 2012 and Rich Ni attended in 2013, Varun Ahuja and Bruce Cai attended in 2014. Toby Schwartz, Milan, Lindsey, Nabeel Rasheed, Eleanore van Marjwik Kooy, Arnav Batta, Yasoob Rasheed, Prathik Kandimalla Sid Gehlaut and Rohan Ahuja continued the tradition of being delegates. Provided social entrepreneurial internships to students in the US as well as in India. Austen Murrow and Sujit Johnston both worked in India in 2011 and 2012 on projects they created under the guidance of Chess Without Borders. Recognized by the MacArthur Foundation in 2010 for its humanitarian work. $200 donation offered. The program raised funds to provide medical care for a little girl living in the slums of India and continues to raise funds to educate her through annual tournaments held for the last 5 years. Over $60,000 has been raised towards this goal. A documentary “A Future for Meher” produced that has been screened in Columbia University in New York and in Amman Jordan along with many other places by youth who have used the screening to raise funds. Gourmet cook and Philanthropist Zein Bertacchi wins the Best Cook Award in Amman, Jordan in 2012. Zein has raised most of these funds through student led projects during chess tournaments since the creation of the mission of combining chess and philanthropy. Established the Maggie Gruber computer center in 2013 for bringing computer literacy to children living in the slums of Delhi, India. A digital version of the textbook ” Chess! Lessons from a Grandmaster” available for the ipad since 2012 is bringing chess to other countries in the rest of the world. Character Award for Dr Kiran Frey from Village of Barrington ; http://shulmanchess.com/?s=kiran+frey in 2013. Over 100,000 volunteer hours donated by thousands of volunteers. Rishi Sethi (President and CEO of Method Mill advances the depth and scope of projects through technology adding videography, digitizing the textbook and engaging social media. Youth form several social entrepreneurial companies named after a mentor died called The Margo Clark Program for Innovation. Amazing ideas and service shared under this program. BHS Team wins 2nd place at Il State CT 2/2019 out of 128 teams.